PESOS AND SENSE is a financial literacy program that covers a wide range of personal finance and investment topics that typically intimidates the average Filipino: the stock market, mutual funds, insurance, budgeting and debt management etc. Its goal is to empower Filipinos by teaching simple and practical knowledge in making independent and wise choices in handling their money. PESOS AND SENSE started as a TV show in September 2011 on GMA News TV which ran for 13 episodes. It was a weekly Sunday morning show that tackled personal finance and investments, simplifying it to a more approachable and doable sense. The show was hosted by Investment Advocate Mr. Aya Laraya, who is also a Certified Securities representative, a Certified Investment Company representative, a realtor and a writer with an MBA from University of Western Australia. Mr Laraya started his stint in the stock market as a simple runner for the old Philippine Stock Exchange. On top of being a licensed stockbroker, he gained relevant experience from other industries such as mutual funds, real estate and banking. 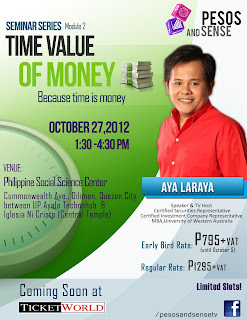 He also shared his financial wisdom with the youth as a professor at the Ateneo de Manila University. After its first season as a TV show, PESOS AND SENSE launched a seminar series which started April this year. The schedule of the seminars is posted on their website, Twitter and Facebook page. Do join in their active online community to get helpful information. 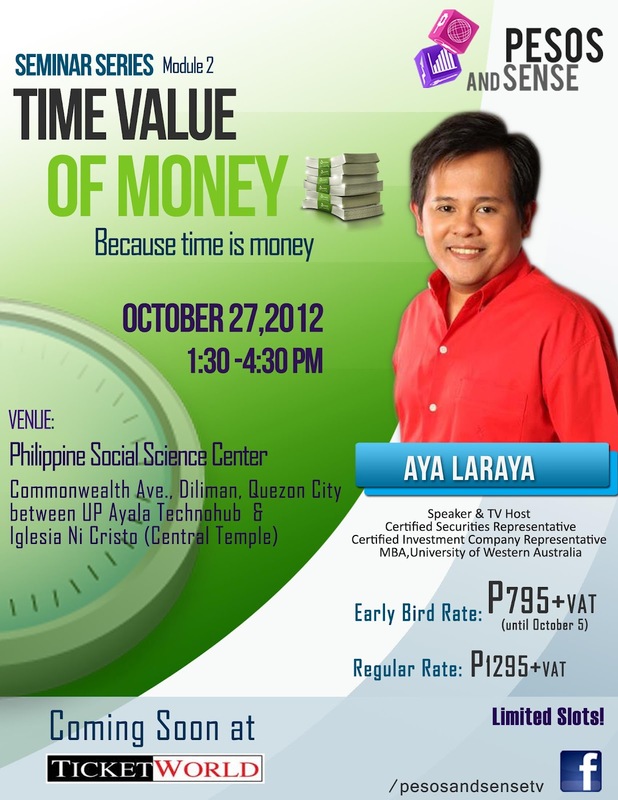 The next seminar will be held on October 20, 2012 entitled Make Your Money Grow (Module 1), 9am-12nn / 1:30pm-4:30pm and on October 27, 2012 for the Time Value of Money (Module 2), 1:30pm-4:30pm at Philippine Social Science Center (PSSC) Auditorium in PSSC Bldg, Commonwealth, Diliman, Quezon City (in between Iglesia ni Cristo Central Temple and UP-Ayala TechnoHub). For tickets and reservations, please call TicketWorld at 891-9999. Register now to avail the early bird rate. 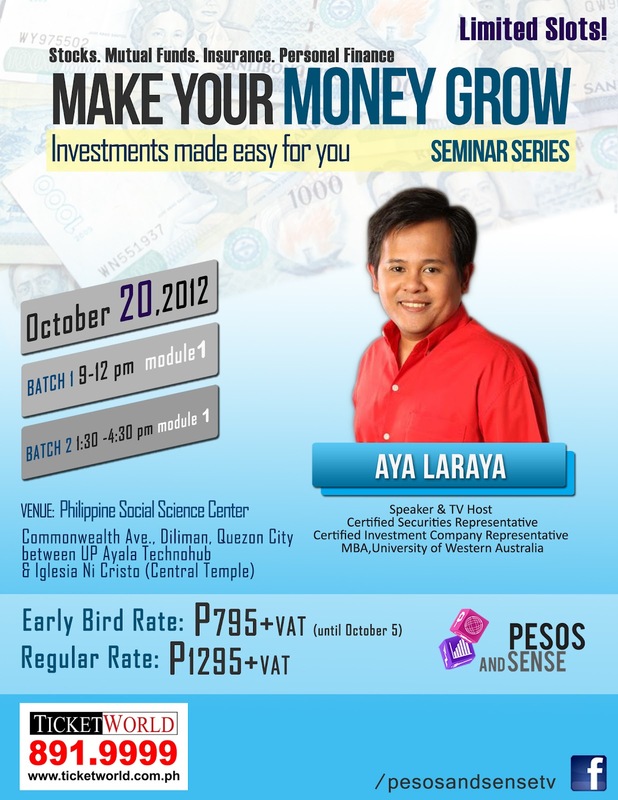 For other inquiries, you may call 430-2237 or email seminars@pesosandsense.com. You may also check them out on Facebook at fb.com/pesosandsensetv. and www.pesosandsense.com.